All that is new in Amazon’s kindle ~ Engineering projects ideas for final year students & paper presentations collection blog. Everybody knows about kindle Paper white which was an EReader from Amazon that bashed the old black and white EReaders formerly available from Amazon with its high resolution screen and 25% better contrast. The tablets came next. 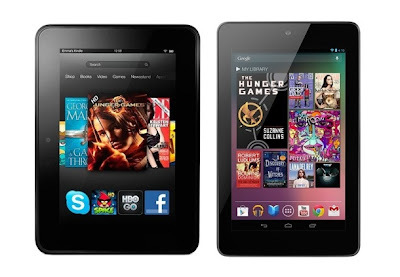 Right away, Amazon raised eyebrows by simultaneously dropping the price of its Kindle Fire while improving the hardware. The Kindle Fire is now just $159 and boasts increased RAM and battery life. Next was the biggest event of Amazon was its launch of KINDLE FIRE HD in two different sizes 7” and 8.9” worth $199 and $299 respectively. The large-size tablet has an impressive 1,920 x 1,200-pixel resolution while the smaller is 1,280 x 800. Amazon says its new tablets have faster wireless connections than any others thanks to dual-antenna dual-band Wi-Fi that supports MIMO (multiple input/multiple output). Next Amazon left all of its buyers in surprise by Kindle Fire HD tablet that packs a 4G LTE connection. Saying it was the one feature that could justify a price point of $499, Amazon CEO Jeff Bezos went on to reveal that customers could get a year of LTE service for the device for just $50 (although the data is capped at 250 megabytes per month). Now, why these things were considered as a big deal? Because the kind of competition that Amazon puts in front with that of the other companies is awesome most of its tablets and EReaders proves to be competitve to its rivalries like Google and apple which couldn’t survive in the market with its Google Nexus 7 and apple iPad. Google improved upon the original Kindle Fire at the same $200 price point with the Nexus 7, Amazon had two countermoves in the revamped standard-def Kindle Fire for $159 and the $199 Kindle Fire HD. On the iPad front, the total cost between a 4G LTE iPad and a 4G LTE Kindle Fire HD is in the hundreds of dollars. As Bezos said, Amazon is looking to make money off its services, not its hardware, revealing its secret to being able to price all its new toys so low. But it also has the effect of putting its competitors between a rock and a hard place in pricing their tablets — especially since not many have the breadth of services (e.g. Prime Video, Appstore and Cloud Player) that Amazon offers. We may also think what is so special about Amazon apart from its prices but there are lots to say like The Paperwhite Kindle has the highest-resolution E Ink display currently available, at 212 pixels per inch. It can also measure your reading speed and tell you how much time it’ll take you to finish a book or chapter. The Kindle Fire HD extends Amazon’s “X-Ray” feature — where you can find more information about subjects in your book — to things like movies and textbooks. You can now also switch from reading to listening as an audio book (say, while you’re jogging), and the Kindle will keep track of your place. There are also new parental controls, letting you do things like set time limits for certain apps, such as video games. Now finally anybody who is thinking to buy an EReader may wait until till this, fall because apple is releasing another small screen iPad which may change the tablet market once again coz iPads are as popular as the Amazon.